Each and every dental office handles the sourcing of its dental products differently. We have found that many of the differences depend on the generational demographics of each office. Whether a dentist is a Baby Boomer, Gen Xer, or a Millennial will have much to do with how their office sources their products. For the purposes of this article, we will focus on disposable, single-use, and infection-control products. The products a dentist and even his staff of dental professionals were exposed to in dental school heavily influence what products they use in their particular practice. Their familiarity with the products they used in school often make the transition into dental practice easier. If they join an existing practice, dentists will likely use the products that the office is already using. Let’s look at the ways practices can learn about new or better products. Reading about products in one of the many available dental trade publications, such as The Dental Advisor. At Richmond Dental and Medical, we particularly enjoy the dental trade show circuit as a method of engaging with dentists and other dental professionals. There are a number of regional, national, and international shows held every year, where manufacturers and distributors have booths to display and discuss the attributes and benefits of their products. Booths often feature product samples as well. But these shows do have their built-in limitations. Most trade shows also offer Continuing Education classes, but the course schedules often conflict or leave little time for the dentists and their staff to get out on the trade show floor. Thus, most distributors and some of the larger manufacturers of dental products deploy sales representatives and account managers to the field, visiting dental offices regularly to promote their products. Many of the larger distributors have their own brands of disposable products that are often white-label manufactured for them by companies to feature the distributor’s own brand. Here’s a word of caution to dentists and other dental professionals when procuring dental products for your practice: When sourcing single-use dental products, it’s also important to note the product’s country of origin. The country of manufacture can have much to do with the quality of the product for its intended use. If the country of origin isn’t clearly identified on the outer box, buyer beware. You should even report these findings to the Federal Trade Commission. 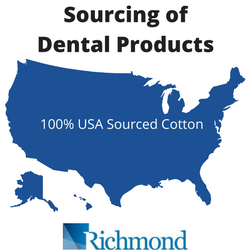 At Richmond Dental and Medical, we source our raw materials here in the United States. Cotton is our primary raw material and it’s grown, harvested, and ginned right here in the 17 states of the southern US. We also have our own cotton purification plants located here in the US, where we purify the cotton to meet all the standards for purified cotton as set out by our regulatory agency, the United States Pharmacopoeia. After purification, we convert the cotton is into premium, quality products such as our Braided Cotton Rolls, Cotton Pellets or even Medical Balls used in dentists’ and physicians’ offices for over 100 years. Dental and medical practitioners must carefully consider the risks involved when deciding on the products they will use for their patients. Imported products from some areas of the world, while available at cheaper prices, have greater risks with regard to quality, performance, and contamination. If you’re starting a new dental practice or looking for products to optimize your existing practice, contact us at Richmond Dental and Medical to start the purchasing process for the industry’s leading dental products.